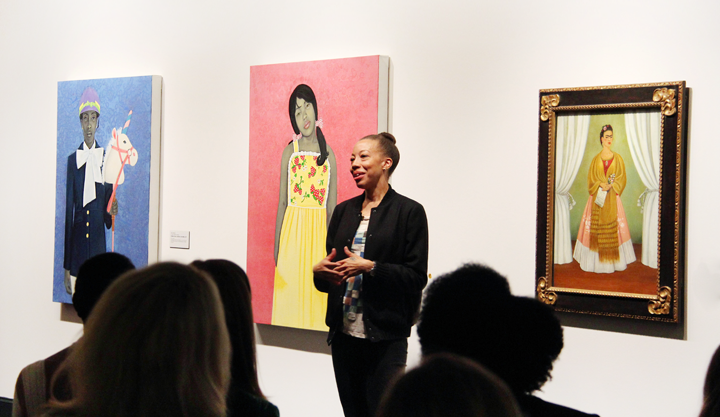 “These are my favorites,” said Amy Sherald, gesturing to two of her paintings on view in NMWA’s collection galleries. “It was a relief to walk in here and see these. 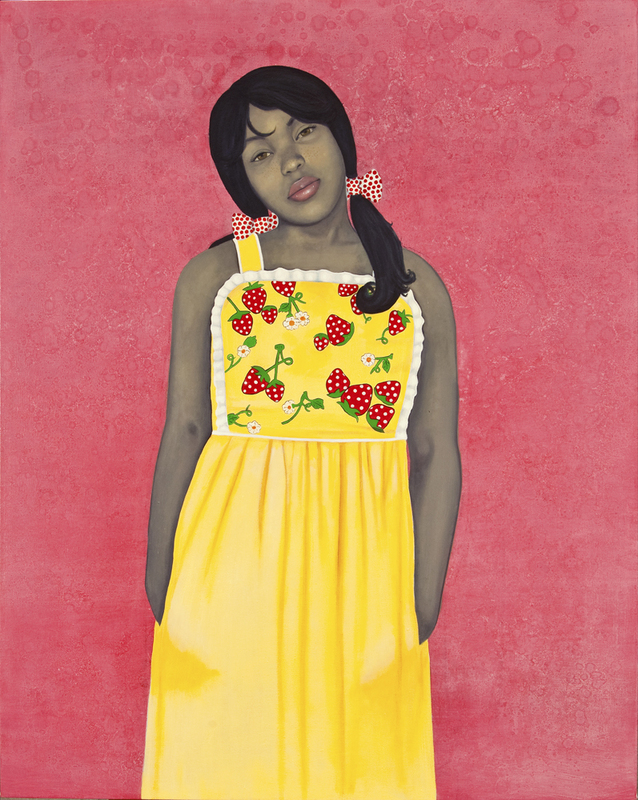 There’s absolutely nothing that I would fix because I had all the time in the world.” After winning first prize in the 2016 Outwin Boochever Portrait Competition for the National Portrait Gallery, the Baltimore-based artist keeps a busy schedule. 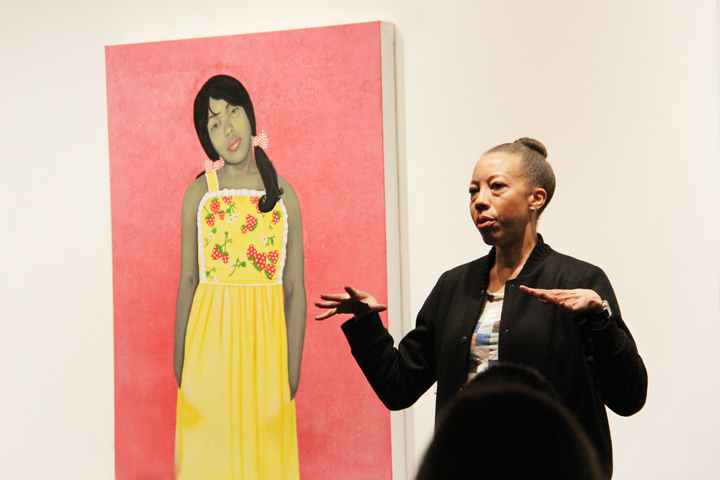 During an Artists in Conversation program at NMWA on May 9, Sherald shared her sources of inspiration and what she hopes viewers will take away from her work. 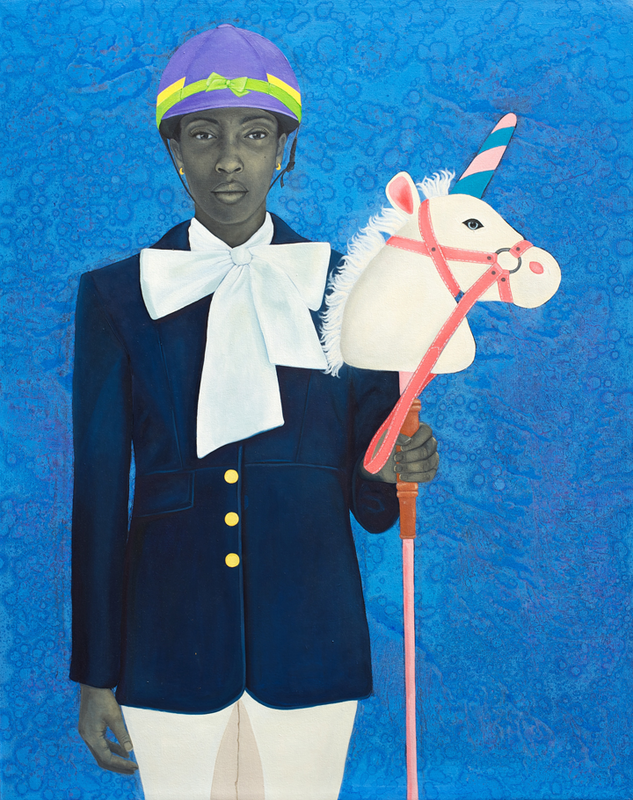 Sherald explained her personal connection to the subject of It Made Sense…Mostly in Her Mind (2011), portraying a horseback rider holding a children’s toy unicorn. “I went to an equestrian riding camp when I was an adolescent,” said Sherald, who later developed the idea for the painting after seeing her friend’s mother do dressage. Sherald asked her friend, Christina, to model for the painting because she embodied the sophistication Sherald wanted to capture. How can NMWA offer a distinctive type of artist talk program, one that engages attendees, activates artwork, and highlights the personalities of the guest speakers? 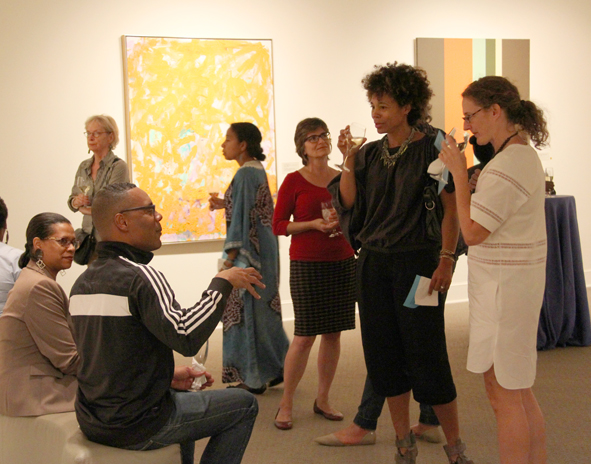 The new “Artists in Conversation” program engages small audiences in the galleries during intimate group happy hour events. 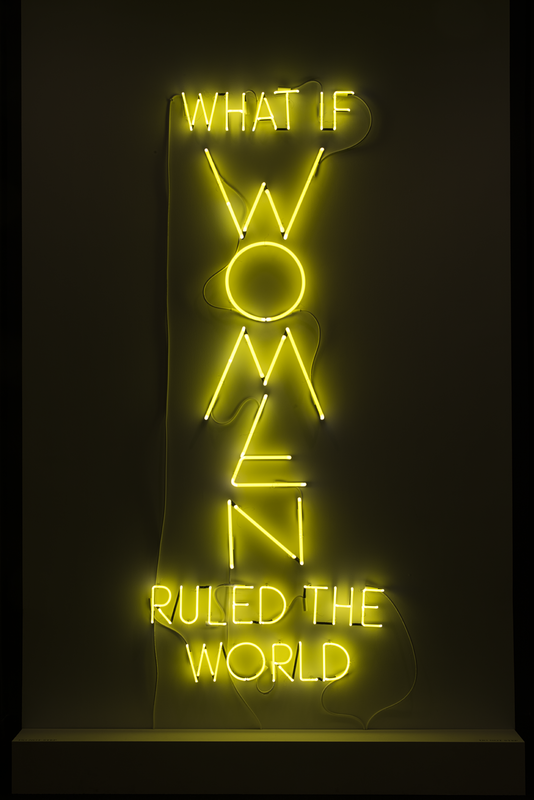 The museum invited artists Rozeal, Analia Saban, Mira Dancy, and Suzanne McClelland for a series of three “Artists in Conversation” programs highlighting their respective works featured in the contemporary exhibition NO MAN’S LAND: Women Artists from the Rubell Family Collection. 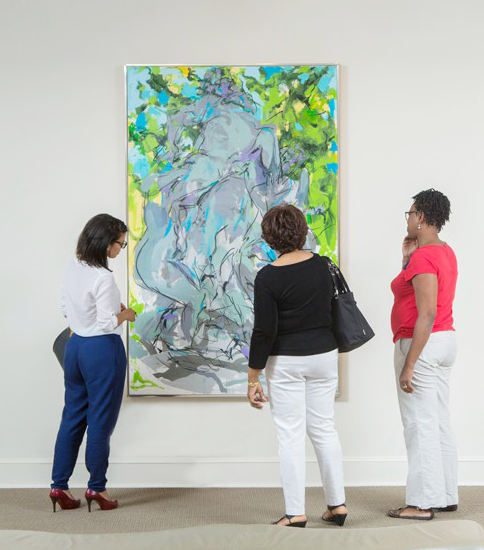 In this new format, participants have time to explore the galleries, look closely at the artists’ works, enjoy food and drink, and engage in conversations with the artists and fellow attendees. 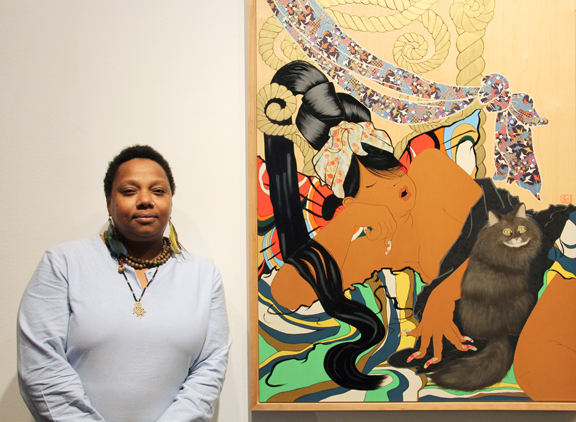 On October 18, 2016, Rozeal captivated participants in a discussion of her work Sacrifice #2: it has to last (after Yoshitoshi’s “Drowsy: the appearance of a harlot of the Meiji era). Rozeal explored the influence of American hip-hop culture clichés on Japanese culture, namely ganguro, a sub-culture fascinated with dark tans and thickly applied contrasting makeup. On November 11, 2016, Analia Saban introduced her works Acrylic in Canvas and Acrylic in Canvas with Ruptures: Grids. “While working on my MFA at the University of California in Los Angeles, I was curious why painting received more attention than sculpture,” explained Saban. By using acrylic and canvas in unexpected ways, she said, “My artwork opens up dialog about the boundaries between these two mediums.” Saban amused attendees with anecdotes about her trial-and-error artistic process. She recounted one night when a sculpture “exploded” and flooded her apartment with acrylic paint. Join us for the delightful opportunity to talk with not just one—but two—NO MAN’S LAND artists in the same evening. On Tuesday, December 13, 2016, Mira Dancy and Suzanne McClelland will converse with small groups about their respective backgrounds, artistic process, and works. Find out what inspires McClelland’s large abstracted canvases and Dancy’s neon nudes. 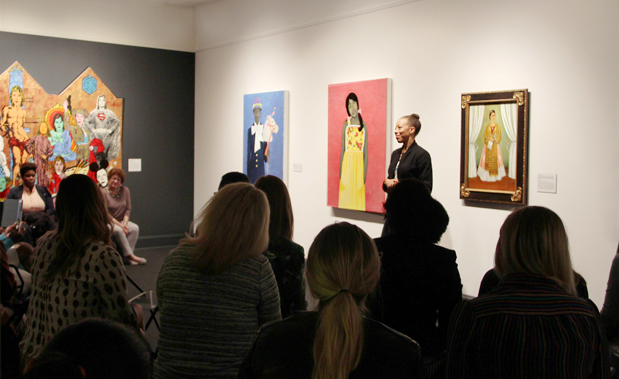 Reserve your spot today for the upcoming “Artists in Conversation” happy hour at the National Museum of Women in the Arts. —Olivia Lussi is the fall 2016 education intern at the National Museum of Women in the Arts. 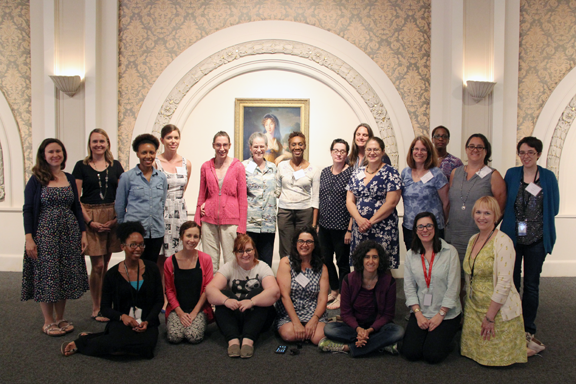 This year marked the seventh Art, Books, and Creativity (ABC) Teacher Institute at NMWA. 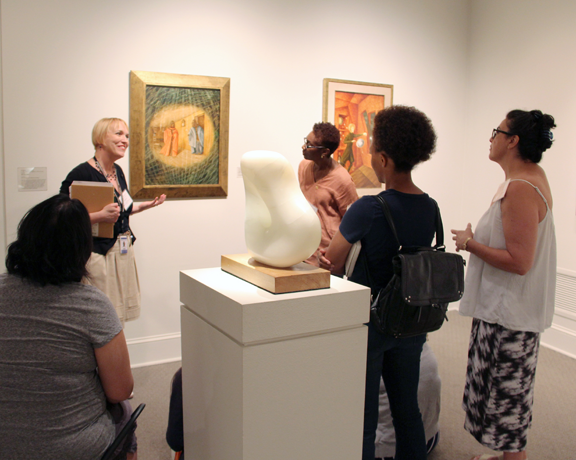 For one week this past July, 18 teachers from New York to North Carolina came to NMWA to explore ways to combine the arts with other classroom subjects. The ABC curriculum encourages growth in students’ visual literacy and critical thinking through the creation of artists’ books. It also incorporates the cultural contributions of women artists and provides teachers with resources to help them integrate the visual arts into their classrooms. Participants began this year’s program with a visit to the Betty Boyd Dettre Library and Research Center (LRC), where they were able to view a selection of artists’ books from the museum’s collection. After seeing examples of the different techniques, participants buckled down to create their own books. Over the course of the week, participants created a portfolio of artists’ books and writing samples to use as future classroom models. Highlights included the opportunity to learn pop-up techniques from paper engineer Carol Barton. Attendees also experimented with printmaking methods by designing journal covers inspired by the exhibition Alison Saar In Print, currently on display in the Teresa Lozano Long Gallery. Over the course of the week, the teachers also learned the basics of Visual Thinking Strategies (VTS), a method of facilitating discussions about art that encourages close looking and engaged thinking. At the end of the week, teachers brainstormed ways to adapt the presented book formats for students of varying ages and abilities. Each teacher completed the program by submitting a lesson concept that incorporated one of the book forms for their own classroom. Ideas ranged from using accordion books to compare French and English fairy tales to flag books examining the similarities between ancient and modern symbols. To access the free curriculum, visit the ABC website. To learn more about the annual ABC Teacher Institute, check out NMWA’s Teacher Institute page. This April, some of NMWA’s oldest paintings entertained the museum’s youngest audience. 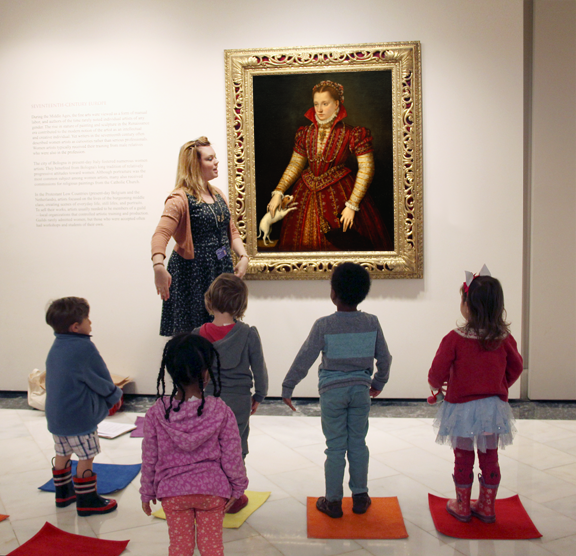 In a series of pilot tours for preschoolers, NMWA’s Education staff led 140 energetic Pre-K and kindergarten students through the galleries to examine portraits, colors, and shapes. 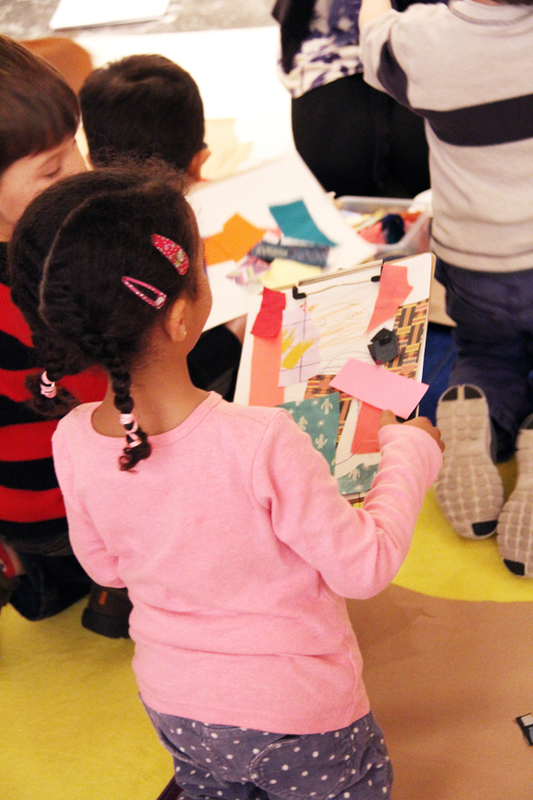 Seated on rainbow-colored carpet squares, tiny visitors listened to stories, explored paintings, and experimented with diverse materials in their own art projects. As the intern charged with crafting this new tour experience, I quickly realized that flexibility was key. Months of planning and research culminated in three thought-out lesson plans. However, unexpected obstacles still arose. School buses ran late, large events occupied the museum’s Great Hall, and an educator was accidentally scheduled to give two tours at once. I designed the tours to last 45 minutes, allow for ten students per educator, and conclude with an art-making activity in the Great Hall. In the end, the tours lasted an hour and art-making occasionally shifted locations. Activities morphed based on the students’ interest, participation, and cooperation. Some of the preschoolers enjoyed using viewfinders to act like “color detectives” while other groups found the tool distracting. 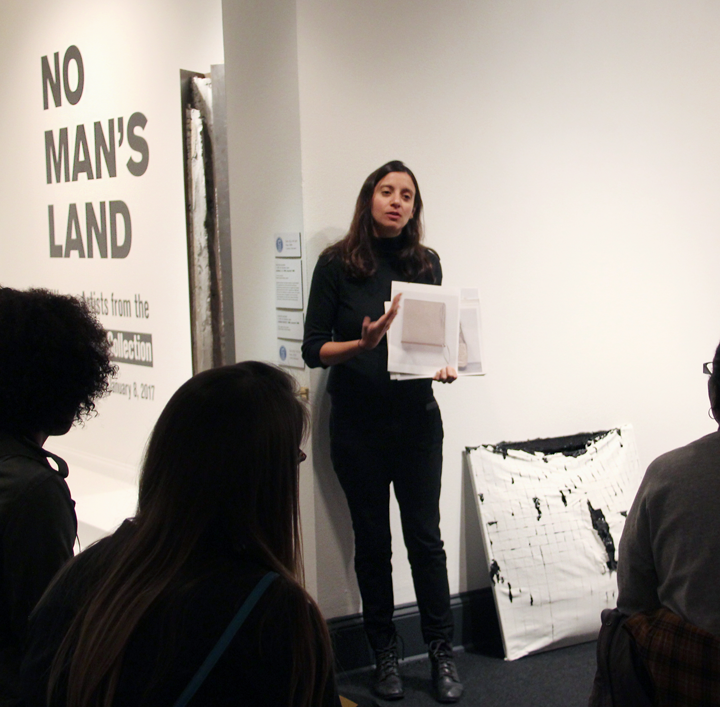 By the last program, we had figured out the most efficient ways to use materials in the galleries. 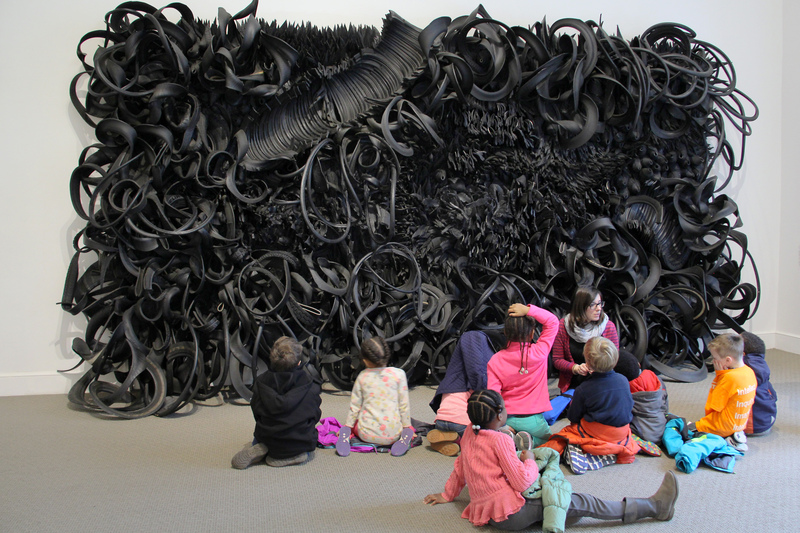 The art-making, movement activities, and stories captivated our young audience. The preschoolers found the dog in Lavinia Fontana’s Portrait of a Noblewoman and the unicorn in Amy Sherald’s It Made Sense…Mostly in Her Mind easy to talk about—as well as the eye-catching outfits of each painting’s subject. They enjoyed mimicking shapes and lines with their bodies in front of Chakaia Booker’s Acid Rain and using “magic paintbrushes” to imagine the expressive brush strokes in Joan Mitchell’s Orange. Students were eager to mix oil pastels and rip colored tape in their hands-on art activities. While creating self-portraits, they used hand mirrors to admire their faces. They were proud to take their artwork home as a reminder of their experience. Overall, the program was a huge success! Logistical hurdles aside, we received positive feedback from teachers and chaperones who thought the tours were engaging and age-appropriate. Hearing kids say, “Wow! This place is cool!” or mention how much fun they had made the entire experience worth every ounce of effort it took to make it happen. I am excited for the future of these tours and cannot wait to hear how they play out during the next school year. —Valerie Bundy was the winter/spring 2016 education intern at the National Museum of Women in the Arts. She is a former Pre-K teacher who is currently pursuing a master’s degree in museum education at the George Washington University. Impress your friends with five fast facts about Abstract Expressionist artist Elaine de Kooning (1918–1989), whose work is on view in NMWA’s collection galleries. 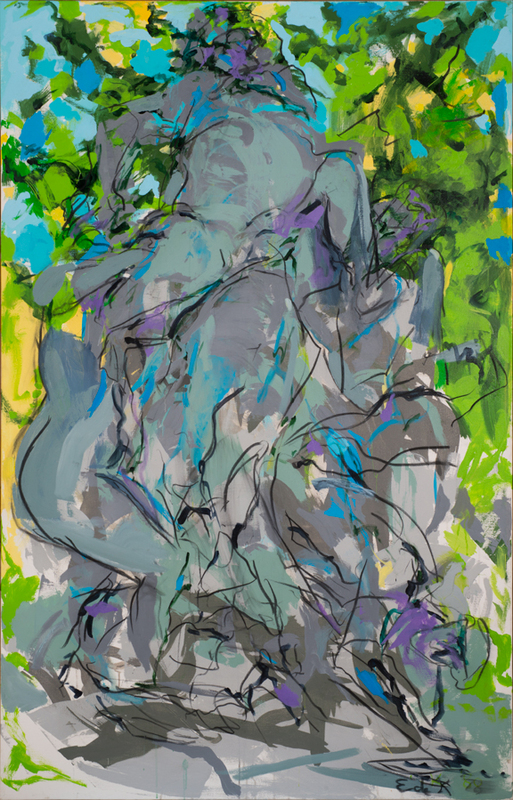 Elaine de Kooning had the reputation of being able to paint a full-length portrait in less than two hours. Though primarily known for her portraiture, de Kooning also experimented with still life. She combined careful depictions of everyday objects with loosely painted, sketchy areas—imbuing the works with a sense of movement contrary to the static feeling of more traditional still-life paintings. In addition to being a painter, de Kooning was also an esteemed writer and teacher. She became an editorial assistant for Art News in 1948 and taught at the University of New Mexico, Carnegie Mellon, and the University of California—Davis. Not a fan of the term “woman artist,” de Kooning preferred to just be referred to as an artist. Once a man approached de Kooning and fellow abstract expressionist Joan Mitchell and asked, “What do you women artists think…” and they both walked away without responding. NMWA hosts free and hands-on thematic tours for students in kindergarten through high school. 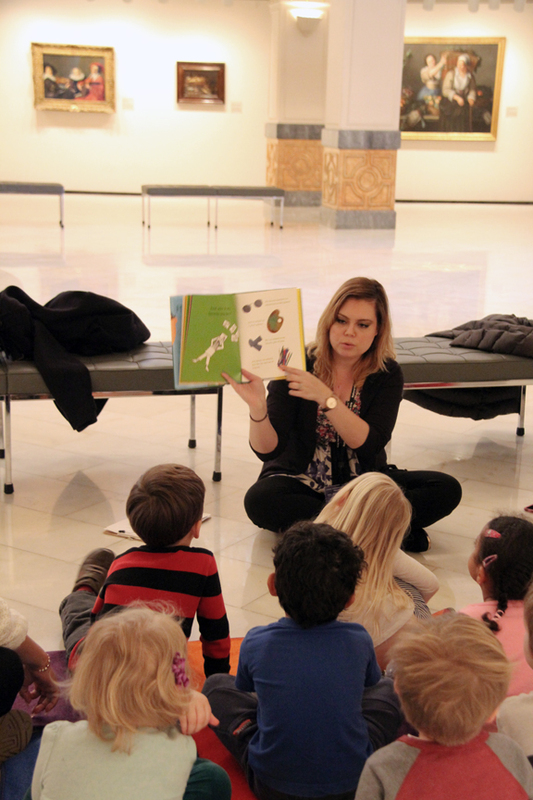 This April, the museum launches a pilot series of tours created specifically for early learners—children ages 3–6. As the Education Department’s intern, I collaborated with the museum’s summer Teacher Institute alumni to create a Pre-K tour for NMWA. Teachers answered surveys, provided feedback on lesson plans, and signed up to bring more than 140 Pre-K students test the museum’s pilot tour. I wanted to create an art-filled tour that would hold the interest of young minds. I considered which museum spaces were best for a young, energetic audience. Are objects positioned low enough for young children to see? Is there space for ten kids to sit comfortably without obstructing other visitors’ paths? Which art materials are allowed in the galleries? How do kids with little legs maneuver quickly through the museum? Feedback from teachers, personal experience, and collaboration with staff helped answer these questions. We decided to offer tours that are shorter than 60 minutes, focus on two artworks, and begin before public hours. This project will introduce early learners to art concepts in three categories: colors, shapes, and portraits. Before exploring the collection, students will listen to a story related to the theme of the tour: My Many Colored Days by Dr. Seuss, Perfect Square by Michael Hall, or My Best Friend is as Sharp as a Pencil by Hanoch Piven. On the tours, we will visit large artworks with a lot of visual interest—like Antoine Cécile Hortense Haudebourt-Lescot’s Young Woman Seated in the Shade of a Tree. Chakaia Booker’s attention-grabbing Acid Rain might be too accessible for little hands, so we wukk explain “museum manners.” They might be asked to look at Lynda Benglis’s Eridanus and re-create its shape and lines with their bodies, identify the colors in Elaine de Kooning’s Bacchus #3 using color-detective spyglasses, or pose like Lavinia Fontana’s Portrait of a Noblewoman before creating their own self-portraits. In the museum’s Great Hall, our tiny visitors will have the opportunity for hands-on material exploration. We will encourage them to experiment with the process of creating by using materials like oil pastels, colored pencils, glue, fabric, and paper scraps. Because the Great Hall’s marble floor would be uncomfortable to sit on, we ordered carpet squares for the kids. Prioritizing the process of making over the final product, we hope to expose Pre-K audiences to authentic materials and get them inspired by NMWA’s collection. The museum’s Great Hall often provides a stunning backdrop for various elegant events, but it’s exciting to think of the space filled with rainbow-colored carpet squares, art supplies, and preschoolers with big imaginations. —Valerie Bundy is the winter/spring 2016 education intern at the National Museum of Women in the Arts. She is a former Pre-K teacher who is currently pursuing a master’s degree in museum education at the George Washington University. NMWA offered the week-long Art, Books, and Creativity (ABC) Teacher Institute for the sixth year, and for the second time also held the Advanced ABC course for returning teachers. 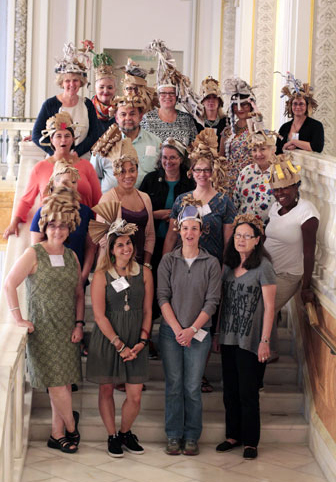 Participants spent the dog days of summer, July 13–17, 2015, learning arts-integration techniques. The ABC curriculum is ideal for third- through eighth-grade educators. During the program, teachers explored new avenues of creativity. Made possible through a grant from the U.S. Department of Education, ABC encourages growth in visual literacy and critical thinking, while also highlighting women artists’ achievements. In particular, the work of Maria Sibylla Merian inspired “bug books,” which encourage students to focus on insect life cycles and habitats. As NMWA’s education intern, I learned as much as the enrolled teachers. I was largely unaware of the many challenges educators face—particularly in issues of literacy in D.C. schools. The Advanced ABC participants discussed ways in which artists’ books could provide visual literacy as a pathway to reading. Unfamiliar with artists’ books, I was not aware of their practical applications. Teachers found new ways to incorporate concepts into their own curriculum plans. One educator based his flag book on famous women of the American Revolution. Another teacher said these techniques would allow her to “feed the artist in my classroom.” Ranging from investigations of traditional Native American cultures to literacy interventions, many advanced lesson plans were ready to be shared with colleagues by the end of the week. Participants also constructed sculptural hats and “star books”—books with complex folds and covers that demonstrate knowledge of shapes and primary colors. The Advanced Institute teachers delved deeper and experimented with circuits to add lights and motorized elements to their books. Toward the end of the program, the two groups converged during a crafty happy hour at the museum. Program participants enjoyed wine and refreshments and then experimented with paste, marbling, and watercolor techniques during a paper-making activity. 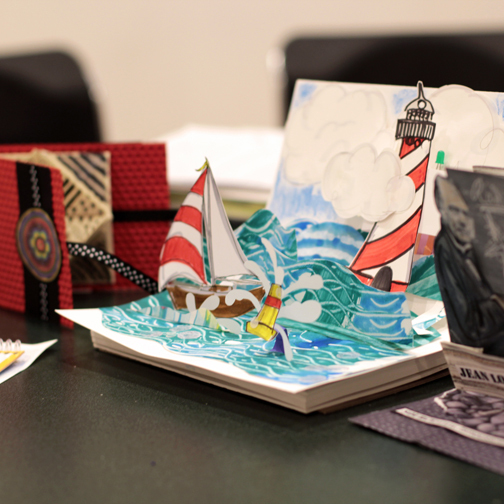 While creating personal portfolios of artists’ books, teachers learned the basics of Visual Thinking Strategies (VTS)—a method for facilitating discussions about art. VTS encourages close looking and deep thinking, where each student feels his or her opinion validated. This method provides an equal playing field for art appreciation and creative engagement. As an art history student, I often ask about a work’s title, artist, or time period. However, I was exposed to new points of view through hearing participants’ personal connections. VTS creates a culture of thinking where students work together as storytellers. To access the free curriculum, visit the ABC website. To learn more about the ABC Teacher Institute, check out the museum’s website.